The mission of Marine Corps Family Team Building is to enhance Marine Corps family readiness, to prepare our families to successfully meet the challenges of the military lifestyle and enhance mission readiness. 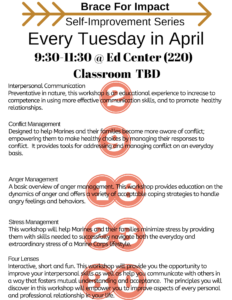 Marine Corps Family Team Building (MCFTB) facilitates six distinct, yet complementary programs: Family Readiness Program (FRP); Lifestyle Insights, Networking, Knowledge & Skills (L.I.N.K.S. ); Life Skills; Readiness & Deployment Support (RDS); Chaplain’s Religious Enrichment Development Operation (CREDO); and Prevention & Relationship Enhancement Program (PREP). For details about each program, select from the list in the next column to learn more. See POC list for contact information. The Prevention and Relationship Enhancement Program (PREP) is offered at the MCBH Chapel. PREP is a one-day couples communication and problem-solving workshop. Participating couples receive one copy of the book “Fighting for Your Marriage,” two PREP one-day notes for couples, and a magnetic speaker/listener technique floor tile. Materials and lunch are provided at no cost. To register, please call 808-257-2650.